South Korean Foreign Minister Yun Byung-se, second from left, guides U.S. Deputy Secretary of State Tony Blinken, second from right, Japanese Vice Foreign Minister Akitaka Saiki, left, and South Korean Vice Foreign Minister Lim Sung-nam, right, during their meeting in Seoul, April 19, 2016. The United States, Japan and South Korea held senior level diplomatic talks Tuesday to discuss joint measures that could be taken if North Korea continues to defy the United Nations Security Council resolution banning its nuclear and ballistic missile development. The trilateral meeting in Seoul among U.S. Deputy Secretary of State Tony Blinken, South Korean Vice Foreign Minister Lim Sung-nam and Japanese Vice Foreign Minister Akitaka Saiki took place amid reports that North Korea is preparing to conduct a fifth nuclear test. The South Korean official said Security Council Resolution 2270, passed in March, includes the provision for additional sanctions against Pyongyang if it commits further nuclear or missile provocations. “If the North goes ahead with a fifth nuclear test, the U.N. Security Council would take correspondingly significant measures, but regarding the details of the measures that would be included in the additional resolution, it would be premature to give you my expectation,” said Lim. Recent satellite images of North Korea's Punggye-ri nuclear test site show only "limited" activity that would not necessarily indicate a test was imminent, said analysts at the U.S.-Korea Institute at the Johns Hopkins University on Tuesday. They note, however, that North Korea has worked to conceal past nuclear preparation efforts. South Korean President Park Geun-Hye said Monday that intelligence sources detected signs that Pyongyang was preparing a new test and ordered her military to stay on high alert. In March, North Korean leader Kim Jong Un ordered further nuclear tests to “assess the power of newly developed nuclear warheads and tests to improve nuclear attack capability," according to North Korean state media KCNA. 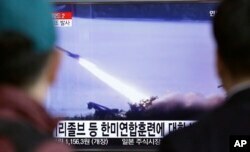 FILE - People watch a TV screen showing a file footage of a missile launch conducted by North Korea, at Seoul Railway Station in Seoul, South Korea, March 18, 2016. Analyst Jeffrey Lewis at the James Martin Center for Nonproliferation Studies in California said satellite images taken over the last few months show an expanding network of tunnels at North Korea's nuclear test site where past blasts have been detonated. South Korea’s Defense Ministry said on Monday the North is prepared to conduct another nuclear test anytime, and that it is likely to be a warhead test that will be conducted underground. North Korea is also believed to have a sufficient stockpile of plutonium and highly enriched uranium to make eight to 12 nuclear bombs. There is an expectation that Kim Jong Un wants to put on a demonstration of nuclear power to reinforce a public perception of him as a strong leader in advance of a major congress of the ruling Workers' Party early next month. 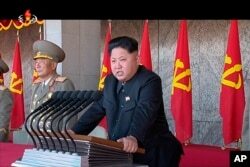 FILE - In this image made from video, North Korean leader Kim Jong Un delivers a speech during the ceremony to mark the 70th anniversary of the country's ruling party in Pyongyang, Oct. 10, 2015. Speculation that another nuclear test was imminent also grew after a North Korean mid-range missile test attempted on Friday ended in catastrophic failure. “We have to at all costs put a stop to this. We are at a very important phase in this regard,” said the Japanese vice foreign minister. North Korea has been under U.N. sanctions since 2006 for its multiple nuclear tests and rocket launches. Tougher new international sanctions were adopted in March in response to North Korea’s fourth nuclear test, conducted in January, and a satellite launch in February that utilized banned ballistic missile technology. The government of Kim Jong Un has so far responded defiantly by firing a number of short- and mid-range missiles and accelerating its nuclear development timeline. In the long term, U.S. Deputy Secretary of State Blinken says the sanctions, which include suspending currency transfers and restricting North Korea’s lucrative mineral trade, will cut off funds to the country’s nuclear program and impose significant economic pain that will force the leadership to return to denuclearization talks. “It takes some time for those measures to actually take effect. So what we’re looking at first and foremost is the implementation of this existing Security Council resolution as well as additional measures that countries are taking individually or collectively to increase the pressure on North Korea,” said Blinken. The deputy secretary of state also urged North Korea to follow the example of Iran, which halted its nuclear program to reach a deal with the West, as well as Cuba and Myanmar, and choose peaceful negotiations over confrontation. "If a country, even one with which we've had the most profound differences, is prepared to engage seriously and credibly in answering the demands of the international community, we are also prepared to engage," he said. 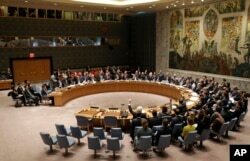 FILE - The United Nations Security Council votes on a resolution during a meeting at U.N. headquarters, March 2, 2016. On Monday, the U.N. Security Council released a list of additional banned items related to North Korea’s nuclear and missile programs, that include certain aluminum, nickel and cobalt magnets, large steel bars and tubes, frequency converters, and chemicals that can be weaponized, such as aluminum chloride, dichloromethane and sodium metal. The trilateral diplomats said it was also important to maintain support for sanctions from North Korea's allies in the region, Russia and China. Beijing’s support for these international sanctions is considered crucial because 90 percent of North Korean trade flows through China. While China has expressed frustration with North Korea’s insistence on pursuing nuclear weapons, it does not want sanctions to spark regional instability that could increase the flow of refugees at the border, or lead to the collapse of the government in Pyongyang, leaving Washington’s close ally, Seoul, in control of the entire Korean peninsula.